These easy and delicious cilantro lime grilled chicken drummies are one of my go-to recipes. Everyone loves the flavor and even those in the family with restricted diets can enjoy them. Prep the chicken drumsticks as you normally would. If you prefer to remove the skin you may do so but grilling with the skin on does help to keep the meat moist and juicy! Place the chicken in a large glass dish. Sprinkle the seasonings over the chicken. 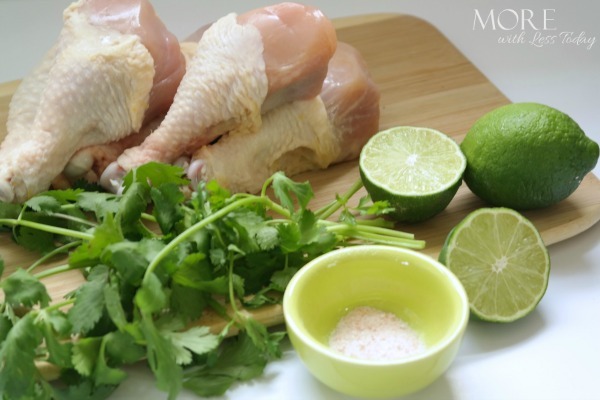 Squeeze the juice of several limes (or use bottled lime juice) over the chicken. Top the chicken with a handful of coarsely chopped cilantro. Cover and store in the refrigerator for 4-6 hours, flipping the meat halfway through. 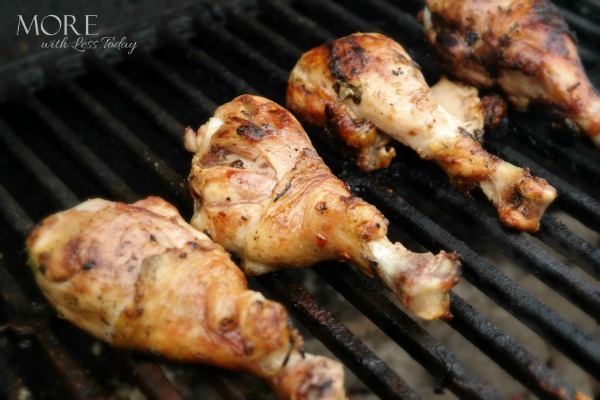 Preheat your grill and coat the grill grates with oil to prevent the chicken from sticking. This chicken is best cooked slowly, over a low to medium heat. We like to use charcoal but a gas grill or over wood fire works great too. 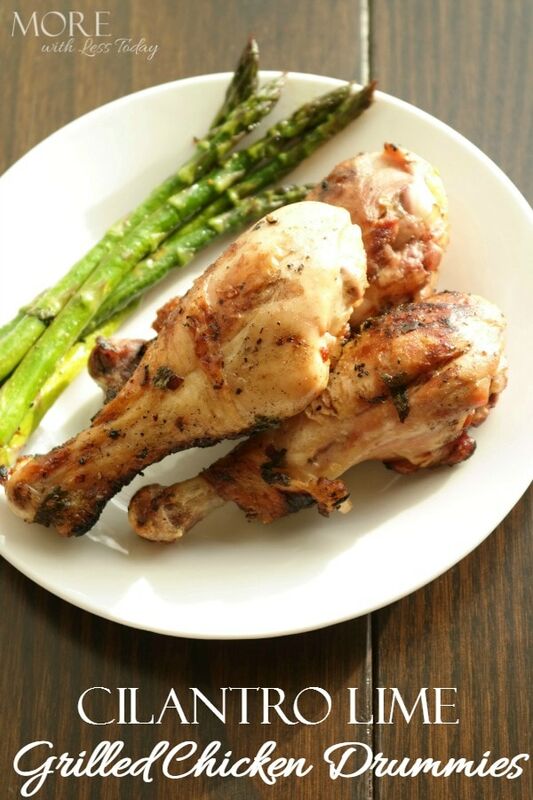 When the internal temperature of the chicken has reached 165 degrees, remove it from the grill and serve! This is great served with whole grain brown rice and asparagus that has also been cooked with lime juice and cilantro. It makes a delicious meal that is gluten free, natural, and healthy! I recommend using a grilling thermometer so you can tell at a glance when your food is cooked. 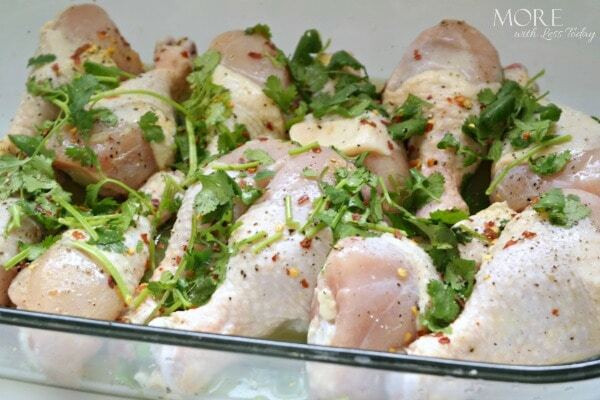 Is that red pepper flakes I see in the photo of the cilantro lime chicken legs?! not mentioned in the ingredients. yes – here are the spices used: Lemon Pepper, Pepper, Onion Powder, Garlic Powder, Cumin, and Red Pepper Flakes to taste. They are listed under ingredients. I hope you enjoy the recipe!